Besides his phenomenal playing, Prince was known for his collection of off-the-wall guitars, among them the Cloud and Symbol, but shortly before he died, the legendary musician could be found wielding a one-off creation from the UK's Gus Guitars: the G1 Purple Special - and before it reached him, we played it. Gus Guitars' Simon Farmer built the Purple Special nine years ago, but logistical wrangles meant it didn't reach Prince during his run of 2007 O2 Arena shows. The guitar soon found its way to Guitarist magazine, where it was photographed, play-tested and returned to Farmer. However, in March this year, Prince's people reached out and asked for the guitar - in an interview with The Guardian, Farmer says, "I still don't know to this day actually what prompted Paisley Park to get in touch… They basically came and picked it up and took it to the States." Prince was photographed showing the guitar to a private audience at one of his Paisley Park shows on 16 April, just five days before his death. 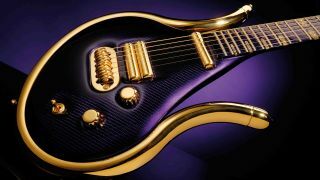 He liked the guitar so much, he commissioned Farmer to make a black-and-gold bass, which Farmer had started work on when Prince passed away. Writing on Gus Guitars, Farmer states, "I feel his loss personally, even though I never met him and mourn the passing of one of the greatest musicians and guitarists ever." Below, we've shared some extracts from our original assessment of Gus Guitars' astonishing custom creation, back in 2008. "Red western cedar forms the core of the guitar, which is subsequently covered with a carbon fibre laminate just 2.5mm thick. That material is always black and is difficult to colour, so Simon uses a finished coat of chrome-finish carbon fibre that allows him to apply the wonderfully over-the-top purple hue. "All metalwork is plated with over £550 worth of 22 karat gold - slightly hardier than the even more bling 24K option - and the plating is three microns compared to the standard one. "The electrics have been wired to suit Prince himself, and the inlays on the fretboard are made from holographic carbon fibre, a material that's not actually manufactured currently. The custom case is also a thing of wonder, matching the purple and gold livery perfectly. "The playability is out of this world - the carbon-fibre board is nearly frictionless - while the mix of available tones from the custom-built pickups is truly expansive." At the time Guitarist tested it, the guitar was quoted as costing £15,000, but given recent events, we'd say it was priceless.